Adults enrolled in Medicare will receive their new Medicare cards over the next 12 months. In fact, by law, all cards must be mailed by April, 2019. Some may receive the cards within weeks, while others will get theirs early next year. In the meantime, here’s what to expect as you wait for your new card to arrive. Cards are rolling out in waves — delivery to a handful of states is now underway. The remaining states will follow on a schedule. As long as your information is up to date, you’ll receive your card at the address registered in your social security account. If you need to update your address, you can do it here. You’ll get a new number — your new Medicare number will replace your social security number on the card. Your 11-digit identification number (which includes letters) will connect to your information in the Medicare system. This will help protect your identity and possible misuse of your SSN. You’ll see 2 additional changes — to increase identity protection, your new card will NOT include your gender or signature. Even with this protection, it’s important to remain vigilant by only sharing your card information with trusted professionals (for example, your doctor and clinicians). You can sign up for an email alert — the alert will let you know your card is on its way. Keep in mind that cards mailing out now will take at least a month to arrive. Your benefits will stay the same — the new card will not change your eligibility, billing or claim status. 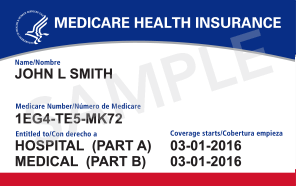 New card, new acronym — once you have your new card, you may hear the term “MBI” or Medicare Beneficiary Identifier. This is simply a fancy name for your new ID number.